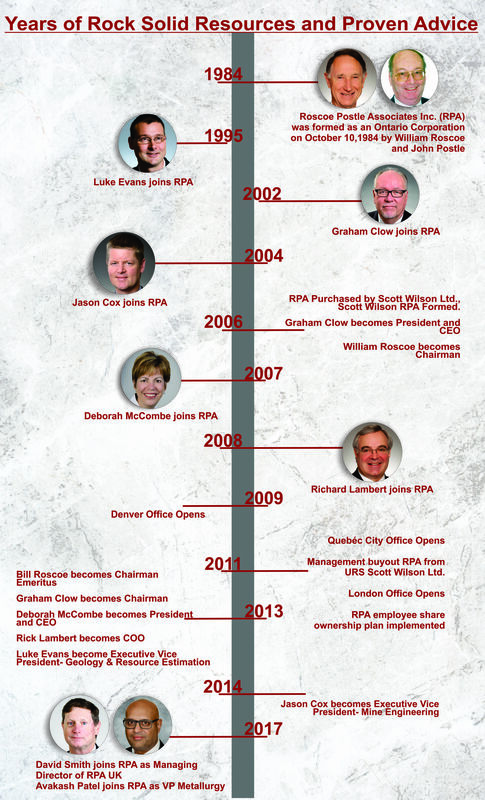 Roscoe Postle Associates Inc. (RPA) was formed as an Ontario Corporation on October 10, 1984 by William Roscoe and John Postle. Bill and John both worked for David S. Robertson & Associates as consultants prior to going out on their own in 1985. The company grew from an initial core of four people in Toronto. The Vancouver office was added in 1998. In 2002, John Postle retired and Graham Clow and Jim Hendry joined as Principals and owners with Bill Roscoe. The Rouyn-Noranda office was opened in Québec in 2005. In April 2006, Scott Wilson Group, Plc, a UK consultancy, acquired RPA. The company took on the name Scott Wilson Roscoe Postle Associates Inc. in Canada. From 2006 to 2010 the group grew to include offices in UK, US, Zambia, and China, and as well as Canada. The Denver office opened in 2009. On February 10, 2011, a management-led investor group consisting of Graham Clow, Bill Roscoe, Deborah McCombe, Richard Lambert, and Wayne Valliant acquired Scott Wilson Roscoe Postle Associates Inc, comprising the four North American offices, from Scott Wilson. The name was changed back to Roscoe Postle Associates, Inc. In May 2011, a new office was opened in Québec City. In 2011, a new office was opened in London, UK. The company now consists of approximately 75 people.